Here's Me Using the Word Blog in a Sentence: Rorschach test is a good way to describe it. Rorschach test is a good way to describe it. 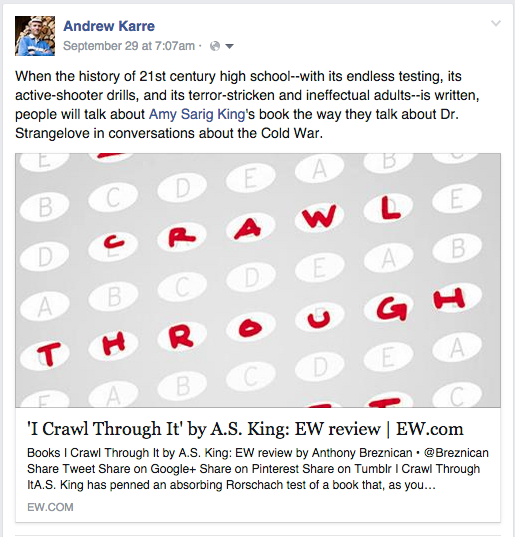 I CRAWL THROUGH IT got an A from Entertainment Weekly. If you know my history with A's, then you know I didn't receive a lot of them after two teachers affected me greatly in 6th and 7th grade. Not entirely their fault (I own my own suitcase, but I was 12 and didn't quite know that then) but all the same, an A is a really nice thing for me. It's taking a while to sink in that I was reviewed in Entertainment Weekly. I still feel like a lady who writes books in a small room while drinking too much herbal tea and that's about it. But there I am, in Entertainment Weekly. Here's the link to the entire review...thanks to my Dutton editor and longtime friend Andrew Karre, who knows how to give a compliment and make a lady spit out her herbal tea. I'm packing now for a long time away. Check my last posts for tour dates and times. I'll see you first, Oregon. Happy Launch Day, I CRAWL THROUGH IT.